John Wesley "Jack" Coombs (November 18, 1882 – April 15, 1957), nicknamed "Colby Jack" after his alma mater, was a pitcher in Major League Baseball who played with the Philadelphia Athletics (1906–14), Brooklyn Robins (1915–18), and Detroit Tigers (1920). 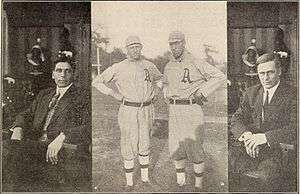 Coombs set a number of records in the American League and World League which stand to this day, and, when he won 31 games while losing nine in 1910, he became one of only 13 pitchers to win 30 games in a season since 1900. Born in LeGrand, Iowa, Coombs moved to Kennebunk, Maine with his family at the age of 4. He played baseball in high school in Freeport, Maine, and, in 1901–2, for Coburn Classical prep school in Waterville, Maine. He was a 1906 graduate of Colby College in Waterville, where he was a chemistry major and a member of Delta Upsilon. He also participated in football, track, and tennis. Colby's baseball field is named for him. Three weeks after graduating, Coombs pitched in his first major league game for Philadelphia, which was a 7 hit shutout, defeating the Washington Senators 3-0. He finished 1906 with a 10-10 record and 2.50 ERA. 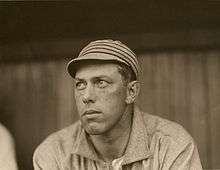 In 1906, he pitched the longest complete game in the American League, 24 innings against Boston, winning 4-1. The following year was not great as Coombs went 6-9 with a 3.12 ERA. In 1908 and 1909 his record was only 19-16 despite his ERA being 2.00 and 2.32 those years. His best season was 1910 which is still one of the best single pitching seasons in MLB history. Besides his record of 31–9, he led the American League in wins (31), games played (45), and shutouts (13), which is still the single season AL record. He won 18 of 19 starts that July and racked up 53 consecutive scoreless innings which was the major league record until Walter Johnson broke it three years later. Don Drysdale and Orel Hershiser have since broken the mark. He also won three games in the 1910 World Series, in which the Athletics defeated the Chicago Cubs. He made appearances in the 1911 and 1916 World Series. In 1919, he was the manager of the Philadelphia Phillies for 62 games, going 18-44 before being replaced by Gavvy Cravath. He returned to play one final year in 1920 before retiring. Coombs became a championship-winning coach at Duke University (1929–52) who sent many players to the majors. Duke University's baseball field is named after him. He spent his retirement as a sports historian and writer. In 1945, he published, "Baseball – Individual Play and Team Strategy". ↑ "The Baseball Bug". Thanhouser Company Film Preservation, Inc. Retrieved 2016-01-22.